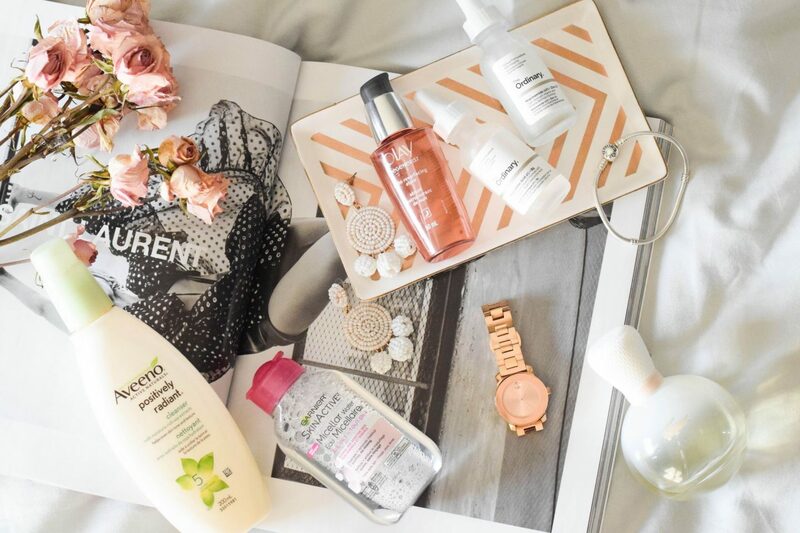 Beauty: Why My Evening Skincare Routine is My Favourite Part of The Day! How many of you go to sleep with your makeup still on? Been there, done that and have woken up immediately regretting it. My face was blotchy from having rubbed half my face into my pillow and it was dry! Not cute. I hated how dreadful my skin looked and felt after having fallen asleep with my makeup on. Those days are far gone – I mean, they do still happen but very rarely. Washing my face at night is literally my favourite and also the most important part of my day now. 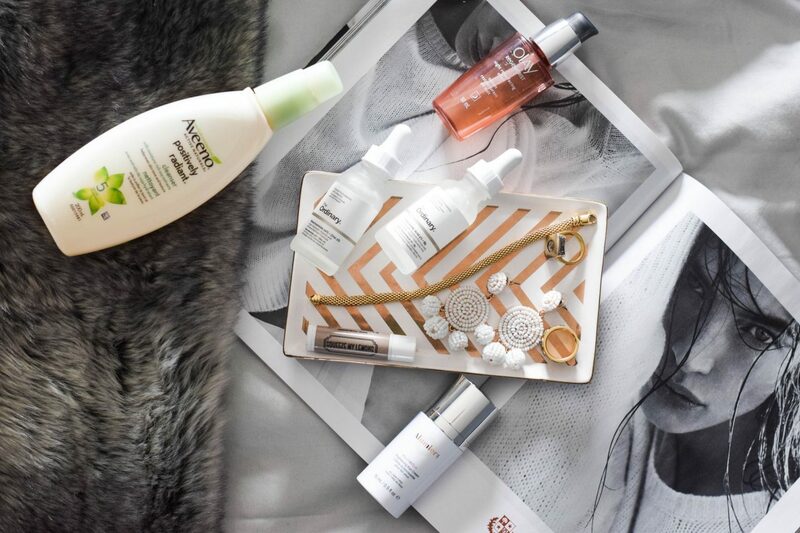 Today I’m sharing why my evening skincare routine is my fave and the products I love! For starters, my evening skincare routine is my fave because it’s my alone time. Am I the only one who feels this way? I’m sure I’m not alone. I love being able to have 15-20 minutes to myself to unwind & wash the day off. Secondly, after a long day of being exposed to so many pollutants, it’s when I can wash them all away. I love using rich serums and velvety moisturizers that exfoliate while also adding moisture back to my skin that bring it back to life! I start my bedtime routine by removing any makeup and dirt with Garnier’s Micellar Water; this stuff is amazing! I like to double cleanse so I follow this by washing my face with Aveeno’s Positively Radiant Cleanser. Having had acne and having used many cleansers, this is one that leaves my skin clean and is extremely gentle. I use Shiseido’s cleansing massage brush on the days that I wear a little more makeup to ensure that i’m getting everything out! (not pictured above). This brush is also great to remove dead skin cells that can often block our pores. My first go-to is Olay Regenerist’s Night Resurfacing Elixir. Paula Begoun, creator of Paula’s Choice skincare line, has a website where she and her team review almost every product under the sun – here; this is where I go for everything skincare related and she’s been right thus far! It was by randomly searching for serums one night that I found a great review of this product and have been using it ever since. It has glycolic which gently exfoliates and is great for those with acne prone skin. hyaluronic acid 2% + b5 followed by the niacinamide 10% + zinc 1 %. I’ve been using these for two weeks and let. me. tell. you. I love this stuff! My skin was in need of a change and these products delivered just that. My skin is hydrated, firm and the glow goals are real! I finish by applying Lavish and Lavender’s lip balm and c’est tout! This routine is a great way to unwind and give your skin the love it needs. So remember, even if you’re tired AF, you’ll be thankful when you wake up with hydrated, glowing skin. And if you haven’t already, make sure you get your hands on some of Deciem’s products; I grabbed both for less than $20- this is less than what you’ll spend on avocado toast + an iced coffee. My 5 Favourite Drugstore Finds for Under $20! Previous Post Wellness Wednesday: Jennifer Lau Shares The Truth About Dairy!